Who is UC Cooperative Extension Glenn County? The University of California's 64 Cooperative Extension (UCCE) offices are local problem-solving centers. More than 400 campus-based specialists and county-based farm, home, and youth advisors work as teams to bring the University's research-based information to Californians. UCCE is a full partnership of federal, state, county, and private resources linked in applied research and educational outreach. UCCE tailors its programs to meet local needs. UCCE's many teaching tools include meetings, conferences, workshops, demonstrations, field days, video programs, newsletters and manuals. Thousands of volunteers extend UCCE's outreach, assisting with the California 4-H Youth Development Program and Master Gardener Program. The University of California Extension was first introduced to Glenn County in 1915. However, the Agricultural Extension and Home Economics office was voted out of the county in 1927, only to be reinstated by voters in a November 1948 General Election. UCCE Glenn County provides programs tailored to meet the needs of county residents. Extension services include exceptional 4-H and Master Gardener programs, as well as expert advice for farmers and growers. Farmers are facing increasing regulation of pesticides, in part the result of environmental concerns about pesticides in water supplies and health effects on farmworkers. The UC Cooperative Extension Office Hours are 8:00am-6:00 pm on Mondays and 8:00am-5:00pm, Tuesday-Friday. Closed 12:00-1:00pm for lunch. 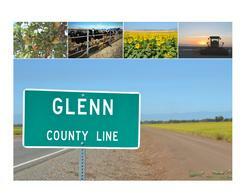 Become a fan of UCCE Glenn County and follow us!